Get the most out of your training. 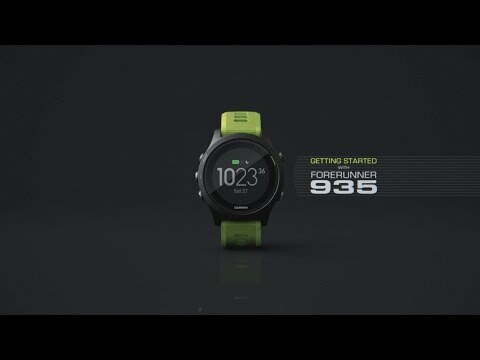 The Forerunner 935 brings the latest evolution of Garmin’s Elevate optical heartrate sensor to the iconic Forerunner line. The heartrate sensor is now slimmer, lighter and more accurate, which lets you train with confidence (and without needing a chest strap). Activity profiles for running, biking, swimming, snowsports, paddleboarding and more allow you to train smarter. To keep you motivated, this device also embraces the social side of fitness. Support for Strava segments and Garmin GroupTrack, are just a few of the ways you can compete and engage with your community. On Wi-Fi, you can effortlessly share your activities on Garmin Connect. Since it links into both standard GPS satellites and GLONASS ones, you get a fast and accurate GPS signal. To keep up with committed triathletes, this bundle includes Garmin's powerful HRM-Tri and HRM-Swim straps to provide nuanced swimming, cycling and running data. The Forerunner 935 isn't just for training days – features like activity tracking, sleep monitoring and smart notifications make it super useful for all parts of your life. Equipped with new lower-profile Garmin Elevate™ optical heartrate monitor. HRM-Tri strap (included) stores swim data when you're in the water, and uploads to your 935 when you're finished. This is Garmin's smallest and lightest strap yet. HR-Swim strap (included) is Garmin's first dedicated swim strap. Non-slip design stays in place even during wall push-offs and is resistant to pool chemicals. Heads up: optical heartrate sensors aren't able to record heartrate under water. For heartrate data during your swims, you'll need to use the included HRM Swim or HRM TRI. Quick-release kit (included) lets you go from handlebar to wrist and back again with a quick quarter-turn. Strava Segment integration lets you know when your starred segment is about to begin and shows instantaneous data of your performance. Also shows how you compare to your PR, the current KOM or QOM, and gives results once the segment is done. TrainingPeaks app integration lets you review workouts, transfer custom workouts and more. Training status uses data from past workouts to learn your fitness level and tell you whether or not the training you're doing is productive. GroupTrack displays the location and telemetry of your contacts that are using compatible Garmin devices. Personal Records functions let you know when you’ve hit your PBs against standard distances like 1-mile, 5K and other popular markers. Virtual racer functions mean you can compete against your own time, friends or pro athletes on Garmin Connect. Wi-Fi-enabled for automatic activity uploads directly to Garmin Connect. Triathlon mode makes it simple to switch from one activity to the next, all within a single recorded workout. It can even log transition times. Custom profiles for running, hiking, cycling, swimming, triathlon, skiing/snowboarding/XC, stand-up paddleboarding, rowing, golf and more. Multisport mode lets you combine any activity profiles into one logged workout. Transition between activities with single button press. Internal accelerometer and gyroscope can detect when you start an activity, like running. They also track speed/distance when you're on a treadmill. Physiological metrics includes VO2 max estimate, lactate threshold (requires heartrate chest strap), race predictor, recovery advisor and performance indicator. Navigates routes created on Garmin Connect backtracks your outbound route or leads you directly to saved waypoints. Altimeter, barometer, thermometer and compass functions. Daily activity features can track steps, sleep patterns and other everyday essentials. Connect IQ support allows you to download apps, templates, data fields, watch faces and more. Automatically syncs data to paired smartphones that are running the free Garmin Connect app. In the box: Forerunner 935, HRM-Tri™ monitor, HRM-Swim™ monitor, Quick-release kit (quick release bracket, wrist bracket, bike mount, 2 pins, 2 screws, 6 bike mount o-rings and installation screwdrivers), extra black watch strap, charging/data cable and documentation.